Oysters tend to be a ‘love them or hate them’ proposition. However, for those who do love them, they’re the perfect thing to serve at a cocktail party or as a first course at dinner. I also think that a lot of people who claim to hate oysters have never really tried them – they just think they look ugly and slimy (which they do, truth be told). Freshly shucked oysters and their sweet, briny liquor go well with a squeeze of lemon, horseradish, cocktail sauce, hot sauce and mignonette sauce (see recipe below). 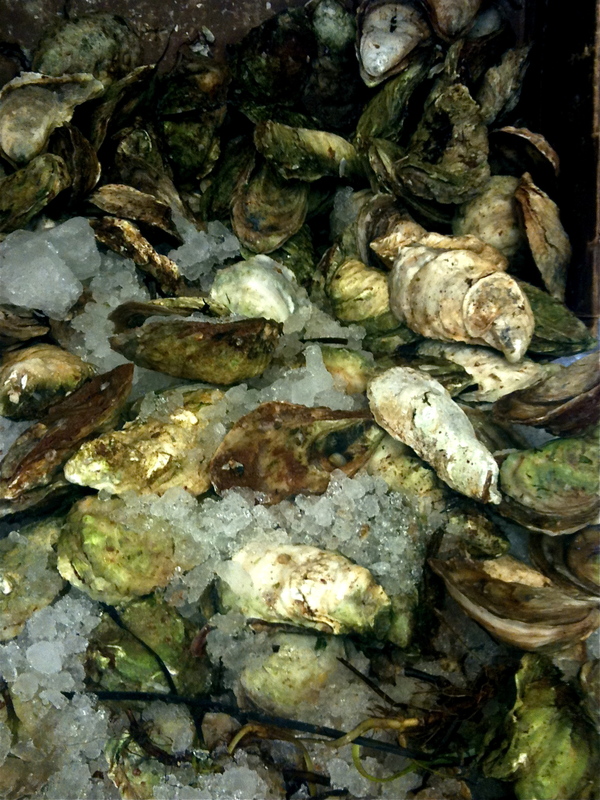 Oysters are in season right now and there should be a wide variety available at good fish markets. The traditional wisdom was that oysters should only be consumed during months with an ‘R’ in their names (ie. the colder months, September to April), however, these days oysters can usually be found year round. A few years ago, I was on Prince Edward Island for a family reunion and my husband and I were wondering if we’d be able to get oysters. We were staying not far from Malpeque so of course we could! We drove a few minutes down the road and found a small dockside fish shop selling fresh oysters for less than a dollar each. We bought a couple dozen, stopped at the liquor store for some sparkling wine and returned to our cottage to feast with my parents (who had never really eaten oysters, despite living in the Maritimes their entire lives). Luckily you don’t need to live on the coast to enjoy them – oysters are shipped around the world and are readily available at most fish counters. Some of my favourite restaurants to order oysters ‘inland’ include: Joe Beef (Montreal), Rodney’s Oyster House and Rodney’s By Bay (Toronto), Starfish and The Ceili Cottage (Toronto). I happen to be partial to oysters from Prince Edward Island and New Brunswick (Malpeques, Caraquet, Raspberry Points, Colville Bay, Lucky Limes, etc.) but oysters are harvested around the world, including in Japan, the Pacific Northwest, Ireland, the Gulf Coast of the U.S. and New England. Shucking oysters is not difficult but it does take some practice. An excellent video from Chef Rich Vellante of Legal Sea Foods gives step-by-step instructions for shucking and preparing oysters: How to Shuck Oysters. 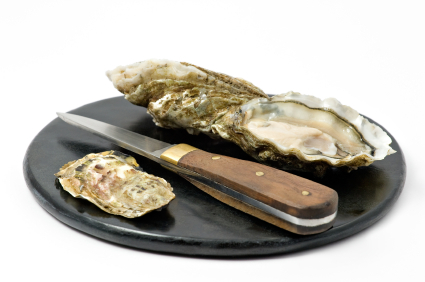 Oyster knives can be purchased at most kitchenware shops and cost as little as $10. To serve oysters, place ice in a large serving bowl or platter. Shuck the oysters (see above) and arrange on the ice. Accompany with fresh lemon wedges and small bowls of seafood cocktail sauce, fresh grated horseradish and mignonette (see below). When selecting a wine to go with oysters, choose a crisp, dry white such as riesling, muscadet, sauvignon blanc or champagne. Beer also works with oysters – try them Guinness for a delicious pairing. Serve in a small bowl alongside a platter of oysters and spoon a small amount of sauce over each oyster before slurping it down. In a small bowl, whisk together all ingredients. Let sit for at least 15 minutes before using. 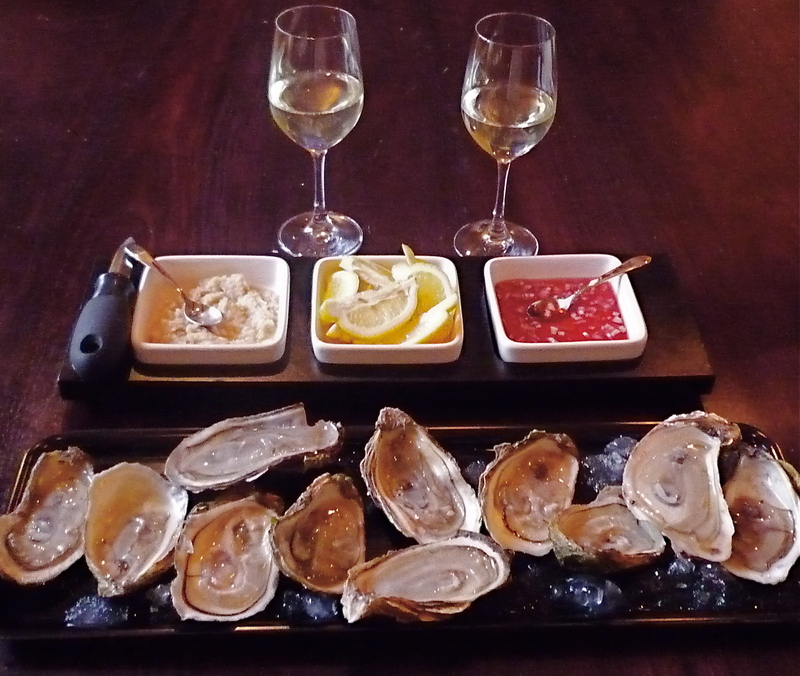 A platter of oysters with (from left to right) horseradish, lemon wedges and mignonette sauce. The wine is a Melon de Bourgogne from Norman Hardie Winery in Prince Edward County, Ontario.